Balloonatics decorations for funerals and memorial services reflect both the solemnity and spiritual nature of these events. 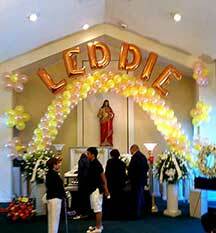 An arch of soft-toned crystal and yellow balloons frames the altar and casket in an atmosphere of peacefulness. This arch was used to convey the spiritual connotations of the rainbow for this memorial service. 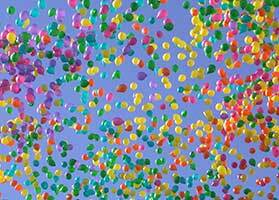 Balloon releases can signify spiritual ascendancy as part of memorial services.